Michigan’s long legacy of ingenuity and innovation is well known and has helped shape our nation and the world. But when it comes down to pure engineering, a few exceptional examples outshine the rest. If your group loves to learn about buildings and structures that are bigger than life, that are expanding the future, or have withstood the test of time, plan a charter tour to these engineering marvels in the Lower Peninsula. A great place to begin your tour is at the Michigan State Capitol in downtown Lansing. Most people raised in Michigan toured the Capitol at some point in elementary school, but seeing it through “grown-up” eyes will prove an amazing experience. Moreover, ongoing restoration of the nearly 140-year-old National Historic Landmark has not only cleaned and improved the historic aspects, but is making it energy efficient with geothermal upgrades. A tour of the Capitol building will reveal the authentic renovation of the building’s original appearance, from the fully-restored cast iron dome — inside and out — to the glass floor in the rotunda designed with 976 pieces of glass. Throughout the structure, more than “nine acres of hand-painted surfaces have been carefully restored to look exactly as they did originally.” The Michigan State Capitol contains so much beauty and history, you’ll want to plan your tour carefully. Find out about scheduling, take a virtual tour and get accessibility information to make this a great day at your Capitol. Just down the road (Michigan Avenue to be exact) is East Lansing, home of Michigan State University, ranked the No. 1 school for nuclear physics by U.S. NewS & World Report, and two of the world’s premier nuclear physics research facilities — the Facility for Rare Isotope Beams (FRIB) and the National Superconducting Cyclotron Laboratory (NSCL). Not sure what goes on there? Find out on a tour of the NSCL where you’ll learn what rare isotopes are, how they are created at half the speed of light, and why we need to study them for the good of mankind. Tour times fill up fast so be sure to plan ahead and reserve your group’s spot soon. And while you’re on campus you might want to consider some of the other great stops like the Eli and Edythe Broad Art Museum or the W. J. Beal Botanical Garden. Next on the tour is the GMRENCEN in Detroit, the tallest building in Michigan. Originally known as the Renaissance Center, a name that was chosen from 141,537 contest entries, these massive structures now define downtown Detroit as it rises from the ashes of decades of neglect and begins its rebirth. Construction on Phase I began on the Renaissance Center in May 1973 and concluded with the grand opening of Towers 100-400, which are four 39-story buildings, and the 73-story hotel. Phase II, Towers 500 and 600, was finished in 1981. These structures are now the Global Headquarters for General Motors and comprise of 5.5 million square feet that includes 1,300 hotel rooms, 29 restaurants, and three miles of walkways and bikeways along the riverfront. Since the original construction, upgrades have included the glass circulating ring made from 288 400-pound glass panels, the 50,000-square-foot Wintergarden with its five story atrium, and renovations for the more than 5,000 GM employees and tenant employees who work there. In fact, the GMRENCEN is so huge they even have an app to help people find their way. This truly incredible structure is almost too amazing to describe and deserves to be considered on your tour of engineering marvels in Michigan. Dedicated on November 1, 1930 by President Herbert Hoover from Washington D.C., the Tunnel is owned by the cities of Detroit and Windsor, Ontario and enables 12,000 vehicles per day — or 4 million a year — to pass from one country to the other with ease. The entire length of the tunnel is 5,160 feet with 2,200 feet under the Detroit River. Construction of the Detroit-Windsor Tunnel required the excavation of 525,000 cubic yards of material weighing 787,500 tons, 80,000 cubic yards of concrete, 11,000 tons of structural steel in total, 2 million granite roadway blocks, and 250,000 wall tiles. It’s a structure that you must see to believe, and it’s just a short drive from the GMRENCEN. 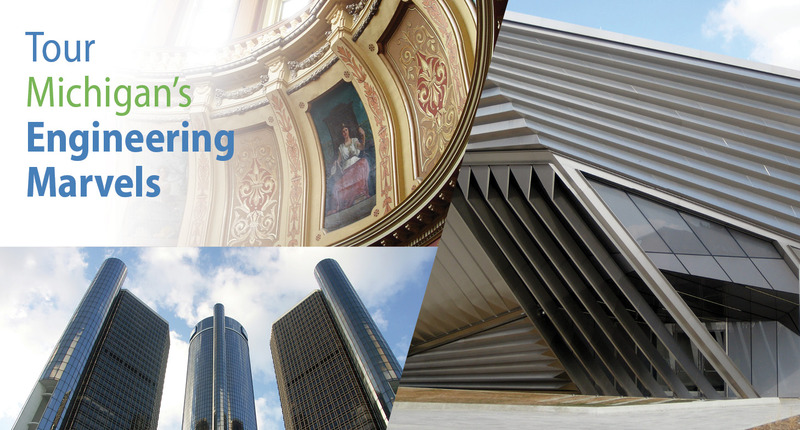 There’s always so much to see and do when you look at Michigan’s past and these recommendations for engineering marvels are sure to please. When you’re ready to book your charter motorcoach, let Indian Trails take the wheel. We know this state better than anyone because we’ve been driving it since 1910.